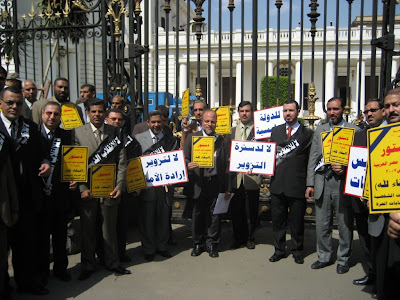 In what I think is a first in Egyptian political history, on Sunday 18 March, 102 opposition legislators began a boycott of parliament’s plenary sessions. 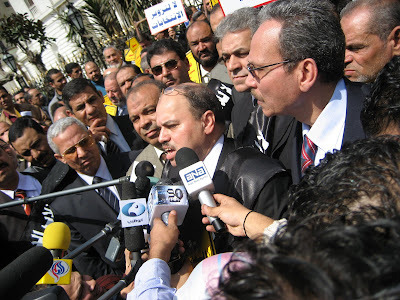 The sessions are devoted to swiftly passing what the Mubarak regime is calling “amendments” to the 1971 constitution. 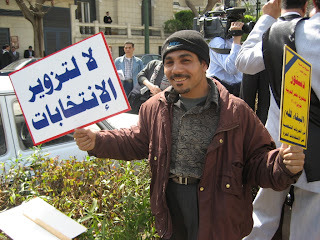 In reality, the alterations augment executive powers and constitutionalise the exclusion of Mubarak’s challengers. 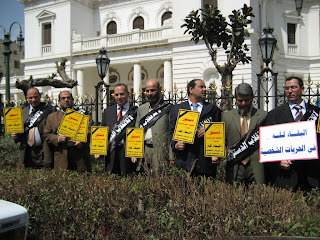 Naturally, what gave the protest its heft was the presence of 88 Muslim Brother deputies, but equally significant was the active participation of Hamdeen Sabahy and Saad Abboud from the Karama party, noteworthy independents such as Gamal Zahran and Alaa Abdel Moneim, and maverick Wafdist Mohamed Abdel Haleem, among others. As prominent deputies made fiery statements to an army of jostling reporters and cameramen, I couldn’t help pondering a couple of glaring ironies. First, Mubarak’s tampering with the constitution has transformed a flawed and musty document into a significant contract of basic rights worth defending. Second, the regime’s attack on the last vestiges of constitutional freedoms is unintentionally fostering coordination and collective action by the parliamentary opposition. For the past several days, independent deputies have been deliberating round the clock to weigh various courses of action, including collective resignation. Ultimately, that option was dropped because (a) lack of time to investigate the full legal and political ramifications of such a momentous decision, (b) the regime would like nothing more than to be rid of the high percentage of opposition deputies and to engineer new, better controlled elections, and (c) the boycott proposal was floated by a dubious source: the revolting and utterly untrustworthy Mustafa Bakri, State Security’s point man in parliament (who of course was not among the 102 boycotters). Obviously we’re still a very long way from a real parliament capable of both checking and bargaining with the executive and forging durable extra-parliamentary coalitions. But I can’t shake off the feeling that what happened Sunday portends something new, perhaps even the spark that may ignite the parliamentarisation of Egyptian politics. The group of 88 are complicating business as usual under the rotunda. 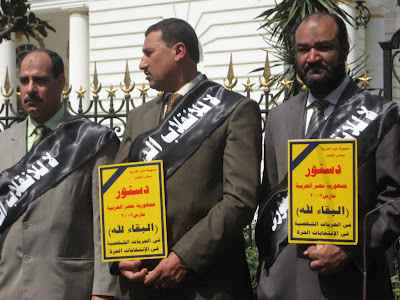 Recall their stand against the extension of emergency rule last spring, their participation in the pro-judges’ protests, and their tireless challenges to Fathi Sorour. If coordination between them and other opposition deputies continues on a variety of issues, then we may have to start taking parliament seriously. This here is Hussein Abdel Hafeez. He was on his daily round of errands in government buildings when he saw the colourful protest, so he decided to watch what’s going on. He had no idea what the protest was about and didn’t care that much, but he did care that it took him entire days to get basic services from the government bureaucracy. He said the MPs looked like good people who would listen to ordinary people’s problems, so he joined in to support them in whatever it is they’re demanding. But then again, public support is trifling compared to what was heaped on judges last spring. Parliament is still very much perceived as the home of crooks, charlatans, and crazies, an institution best dismissed and mocked, and always steadfastly avoided. 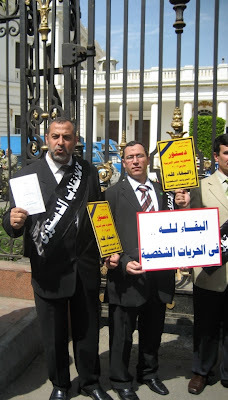 I can’t imagine Egyptians taking to the streets to rally around their legislators. But I also can’t stop wondering when and how the People’s Assembly will turn into a real institution. When will parliament make a real claim to represent the people and check the executive branch? I have no idea, but I’d bet on the role of independent MPs, regardless of their political affiliation. Their burgeoning collective action, the linkages they forge with constituents, and their ability to annoy and perturb the ruling regime and break up its power monopoly are the real building blocks of representative democracy.